The cloud deployment model in the LPWAN market is projected to grow at a CAGR of over 68% over the forecast timeline. The customers prefer cloud platforms for quick IoT network deployment. The LPWAN market growth is attributed to the increase in the demand for unlicensed & licensed LPWA technologies to improve coverage, extend devices battery life, and reduce costs as compared to traditional cellular connectivity options. The growing deployment of IoT-enabled applications, such as smart water meters, precision agriculture, and smart transportation, is increasing the need for reliable connectivity solutions that can connect multiple & remote devices cost-effectively. The favorable government initiatives to support the development of smart cities will also expedite LPWAN market demand. 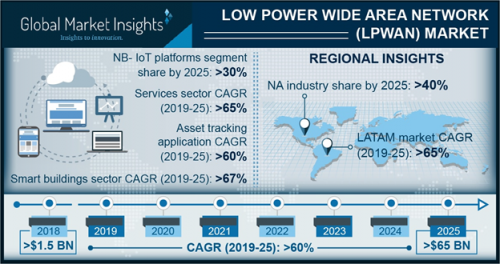 The NB-IoT platforms segment in the low power wide area network (LPWAN) market is expected to witness the fastest growth rate of over 90% from 2019 to 2025. The growing IoT network ecosystem will generate the demand for networks that can provide connectivity to IoT devices, which require low mobility and low levels of data transfer such as smart water meters. NB-IoT technology improves the power consumption of these devices and meets the demanding coverage requirements. In the services segment, professional services are expected to dominate the LPWAN market in 2025 with a share of over 64%. The professional service providers offer various technical as well as advisory services to organizations to meet the demands of the evolving business environment. Through professional services such as consulting and support solutions, the service experts provide hands-on technical assistance and assist in network planning to make the deployment of LoRa networks easier. The cloud deployment model in the LPWAN market is projected to grow at a CAGR of over 68% over the forecast timeline. The customers prefer cloud platforms for quick IoT network deployment. By using the cloud deployment model, organizations can significantly reduce the deployment timeline and easily manage cloud-enabled LPWAN servers and gateways. The companies operating in the LPWAN market are also offering cloud platforms, which will enable users to easily manage the data generated by IoT sensors and allow network operators to monitor the LPWA network. The smart parking application segment is expected to exhibit a growth rate of over 68% from 2019 to 2025. The technology, particularly NB-IoT, is gaining popularity in smart parking applications as it provides an extensive coverage to support communication among various sensors installed in the parking bays. With the growing need for assured parking space and to minimize the waiting time at the ticket collection counter, the use of LPWA networks in smart parking projects will increase. The utilities LPWAN market is expected to hold a market share of over 17% in 2025. Power and oil & gas companies are facing connectivity challenges due to the rapidly-changing operating environment. Due to the rising need for smart meter connectivity, remote monitoring of transmission & distribution network, and predictive maintenance, the demand for LPWAN technologies will increase to a greater extent. The utility companies are adopting LPWAN technologies to drive high performance and increase operational efficiencies. The Asia Pacific LPWAN market is expected to witness the fastest growth rate of over 68% during the forecast timeline. The countries in the region including China, India, and the Netherlands are witnessing a surge in the adoption of IoT solutions in various industry verticals such as agriculture, manufacturing, utilities, and logistics. 4.3.3. Huawei Technologies Co. Ltd.
Organization: Global Market Insights, Inc.